I don't even remember how I came upon this recipe. Seeing it, I thought it was a must-try! Since we we don't bake much and hence, wouldn't have any baked goods lying around the house, I thought this might be a quick fix during those "I really want a chocolate brownie/cake" moments. 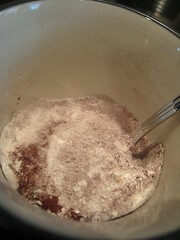 Flour, sugar and cocoa powder go into a cup. An egg follows, followed by some oil (or butter, I suppose). Vanilla extract, if you roll that way. 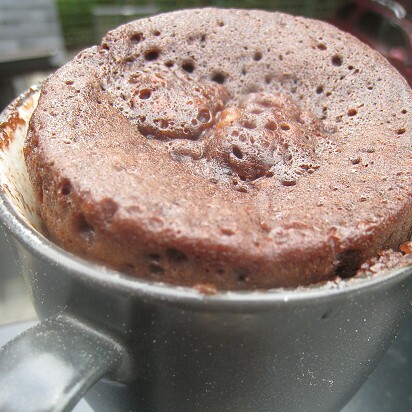 In the microwave for a couple of minutes and voilà! Mine was a tad overcooked because I followed the 3-minute cooking time. I will have to microwave it for much less next time. 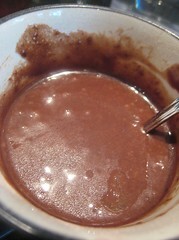 It's not the best, but how can one argue with an instant chocolate craving fix? oh, if chocolate didn't make me sick, I would be in the kitchen making these. This is perfect for the instant chocolate fix - too bad I don't have a microwave, but I'm sure it'd be fine in the oven... They look like lava cakes - delish! I have this recipe bookmarked too! i'm dying to try it now! Oh, this is just the height of instant gratification, isn't it? 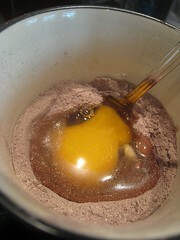 Cool quick-fix for the chocoholics like my husband! Haha! Thanks for sharing! Hope you get to enjoy chocolate very soon! Hehe, these are bad news. Now one can make chocolate cake whenever, in no time. 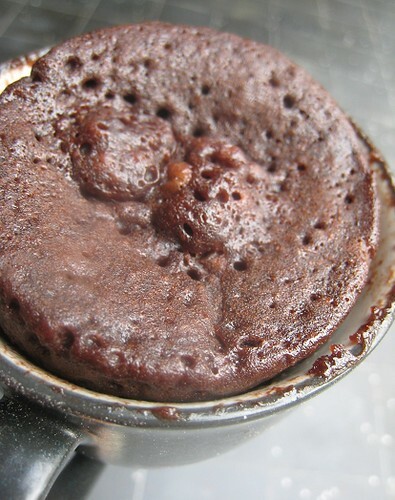 Although, they are no substitute for real, fudgy brownies. Mmm. Thanks for the heads up. We'll check it out. Teehee... people nowadays want everything fast and esy, tsk tsk tsk. LOL. Yum! Thanks, i'm making this when i get home!!!! Are there specific measurements? Or is it just like experimenting with the whole thing? I've placed a link to the recipe within the post.